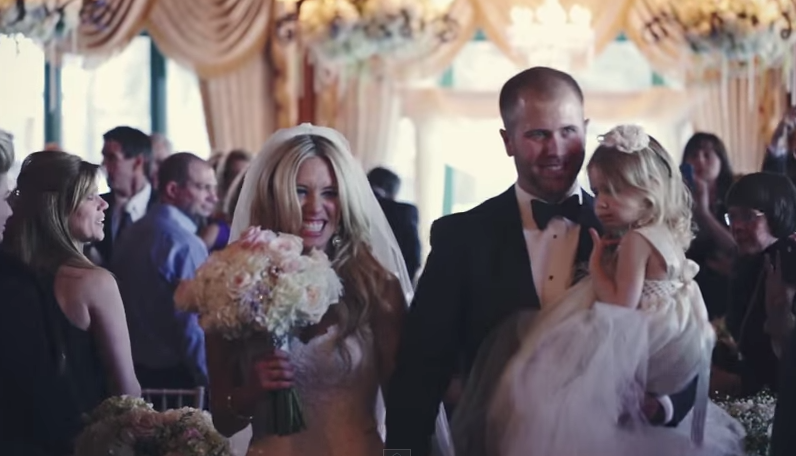 On his wedding day last January, NASCAR driver Brian Scott recited vows to not one, but two of the important ladies in his life: his bride Whitney Kay and her then-3-year-old daughter Brielle. The couple tied the knot on a snowy day in McCall, Idaho. At one point during the ceremony, Scott bent down so he could be eye-to-eye with Brielle and made a heartfelt promise to love and care for her, no matter what. "I promise to always hold your hand and skip with you down the street and bring comfort to your life," he said. "I vow to make you say your prayers before you eat. I promise to read you stories at night and to always tuck you in real tight. I vow to show you how a man should treat a woman in my relationship with your mother. And above all else, I vow to protect you, care for you and love you forever." 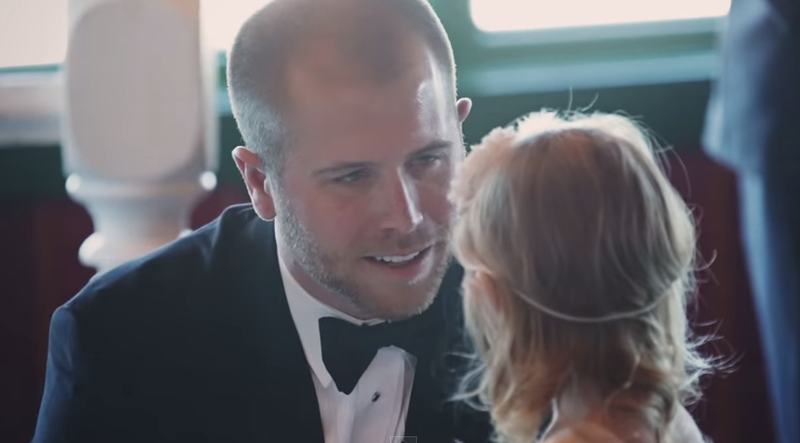 The emotional video -- shot by wedding videographer PenWeddings -- was posted to YouTube last year, but recently resurfaced and went viral with more than 350,000 views at the time of publication. HuffPost Weddings caught up with Scott on Wednesday and reminisced about that snowy day last year, which he called "emotional and surreal." "I always felt like my vows to my wife Whitney would maybe affect me more and I would get more choked up during those, making those promises to her," he told The Huffington Post. "But I misread that one. It was really when I was reading my vows to Brielle that I got the most choked up. It really all just hits home in that moment -- you're there and dressed up and all the people around. You're living in the moment. It affects you more than when you write it or plan for it or practice it. You get engulfed by it." The Scotts, who live in Charlotte, North Carolina, first met through mutual friends in 2011. In November 2014, they welcomed a baby boy named Joseph. So far, Scott says he's really enjoying fatherhood. "Just being there for [the kids] and enjoying family moments together and playing with them and hearing them laugh and seeing them smile -- all of those things are so much better than any of the negative aspects people like to bring up about having kids. It’s not baggage -- it’s great addition [to my life]."